When it comes to tile and grout cleaning San Antonio you have your pick of tile and grout cleaners. Each has their own method of cleaning and price but if your going to have your tile and grout cleaned why not hire the best? So how do you know who’s the best? Well, price is just one part of the equation but the result is the biggest part. If they can’t prove the results they can produce don’t trust them. Beyer Carpet Cleaning has performed their fair share of tile and grout cleaning jobs. They have cleaned commercial and residential tile and grout with outstanding results. 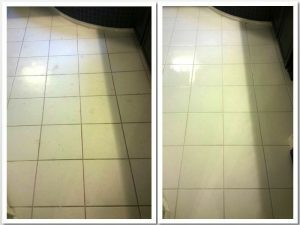 They have pictures on their website showing before the tile was cleaned and after they cleaned it. The results are impressive and so is the price. You surely can’t beat $0.50 per square foot when it comes to not just a tile and grout cleaning but a tile and grout restoration. The average price per square foot for tile and grout cleaning in San Antonio is about $0.70. So for the professionalism and cleaning Beyer Carpet Cleaning is worth the phone call. Their full service tile and grout cleaning includes an extensive scrub and steam clean. They put down an alkaline or acid and scrub it in to remove any dirt and grim that has caked up in your tile and grout. Once that is done they bring a steam cleaner that was made especially for tile and grout cleaning. Some tile and grout cleaners use their carpet cleaning wand to clean the tile which is a big NO NO! They run the risk of damaging your tile and not giving you a thorough cleaning. Beyer Carpet Cleaning only uses the proper equipment to clean tile and grout. Once the tile has been scrubbed and steam cleaned you will be able to see the results right away! 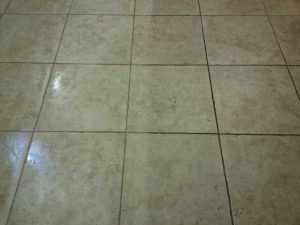 People are astonished by the results and are thrilled to spend the money they did for tile and grout cleaning. Don’t put the cleanliness of your tile and grout in a stranger’s hands put your trust in Beyer Carpet Cleaning. They will take care of your tile and grout cleaning needs and will more than impress you with what they can do. If you have tile and grout cleaning needs or carpet cleaning needs or upholstery cleaning needs Beyer is the company for you. Visit their photo gallery to see proof of the results they can produce for you.